Realistic nonlinear movements with useful basic functions. with start and end at v = 0 and a = 0. 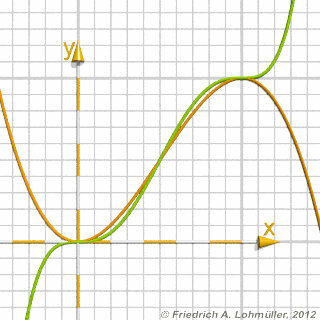 For a movement starting and ending with v = 0 and a = 0, we should use a function, which not only have the 1st deviation with f'(0)=0 (start) and f'(1)=0 (end). The difference is obvious in the opposite image. come back and end smooth. the 1st and 2nd deviation = 0 at <0/0> and <1/1>. Therfore we get: f = 0, e = 0 and d = 0.